Almost everyone now accepts that the United Nations brought cholera to Haiti last month. The evidence is overwhelming and many experts (including the head of Harvard University’s microbiology department, cholera specialist John Mekalanos) made up their minds to that effect several weeks ago. Poverty and a lack of rudimentary infrastructure compels much of Haiti’s population to drink untreated water, but there has been no cholera there for decades. Haitians have no experience with – and therefore little resistance to – the disease. All the bacterial samples taken from Haitian patients are identical and match a strain endemic in southern Asia. Cholera broke out in Nepal over the summer, and in mid-October a new detachment of Nepalese UN troops arrived at their Haitian base in Mirebalais, near the Artibonite river. A few days later Haitians living downstream of the base started to get sick and the disease spread rapidly throughout the region. On 27 October, journalists visited Mirebalais and found evidence that untreated waste from UN latrines was pouring directly into an Artibonite tributary. By early November, Mekalanos couldn’t see “any way to avoid the conclusion that an unfortunate and presumably accidental introduction of the organism occurred” as a result of UN troops. Mekalanos and others also refute UN claims that identification of the source should be a low public health priority. Probably as a result of UN negligence, more than 1,200 people are already dead and 20,000 infected, and the toll is set to rise rapidly over the coming weeks. So is the number and intensity of popular protests against this latest in a series of UN crimes and misadventures in Haiti in recent years, which include scores of killings and hundreds of alleged rapes. Rather than examine its role in the epidemic, however, the UN mission has opted for disavowal and obfuscation. UN officials have refused to test Nepalese soldiers for the disease or to conduct a public investigation into the origins of the outbreak. Rather than address the concerns of an outraged population, the agency has preferred to characterise the fresh wave of protests as a “politically motivated” attempt to destabilise the country in the runup to presidential elections on 28 November. Protesters have been met with tear gas and bullets; so far at least three have been killed. So far, in fact, so normal. 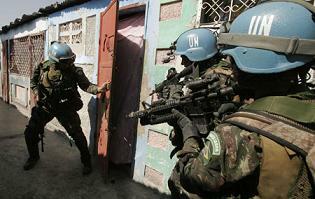 The truth is that the whole UN mission in Haiti is based on a violent, bald-faced lie. It says it is in Haiti to support democracy and the rule of law, but its only real achievement has been to help transfer power from a sovereign people to an unaccountable army. To understand this requires a little historical knowledge. The basic political problem in Haiti, from colonial through post-colonial to neo-colonial times, has always been much the same: how can a tiny and precarious ruling class secure its property and privileges in the face of mass destitution and resentment? The Haitian elite owes its privileges to exclusion, exploitation and violence, and only quasi-monopoly control of violent power allows it to retain them. This monopoly was amply guaranteed by the US-backed Duvalier dictatorships through to the mid 1980s, and then rather less amply by the military dictatorships that succeeded them (1986-90). But the Lavalas mobilisation for democracy, which began in the 1980s, threatened that monopoly and with it those privileges. In such a situation, only an army can be relied upon to guarantee the security of the status quo. Haiti’s incompetent but vicious armed forces, established as a delegate of US power, dominated the country for most of the 20th century. After surviving a brutal military coup in 1991, Haiti’s first democratically elected government – led by president Jean-Bertrand Aristide – finally demobilised this hated army in 1995; the great majority of his compatriots celebrated the occasion. Lawyer Brian Concannon recalls it as “the most important step forward for human rights since emancipation from France”. In 2000, Aristide was re-elected, and his Fanmi Lavalas party won an overwhelming majority. This re-election raised the prospect, for the first time in modern Haitian history, of genuine political change in a situation in which there was no obvious extra-political mechanism – no army – to prevent it. The tiny Haitian elite and their allies in the US, France and Canada were threatened by the prospect of popular empowerment, and took elaborate steps to undermine the Lavalas government. In February 2004, Aristide’s second administration was overthrown in another disastrous coup, conducted by the US and its allies with support from ex-Haitian soldiers and rightwing leaders of the Haitian business community. A US puppet was imposed to replace Aristide, in the midst of savage reprisals against Lavalas supporters. Since no domestic army was available to guarantee “security”, a UN “stabilisation force” was sent in at the behest of both the US and France. The UN has been providing this substitute army ever since. At the behest of the US and its allies, it arrived in Haiti in June 2004. Made up of troops and police drawn from countries all over the world, it operates at an annual cost that is close to twice the size of Aristide’s entire pre-coup budget. Its main mission, in effect, has been to pacify the Haitian people, and make them accept the coup and the end of their attempt to establish genuine democratic rule. Few Haitians are likely to forget what the UN has done to accomplish this. Between 2004 and 2006, it participated in a campaign of repression that killed more than a thousand Lavalas supporters. It laid siege to the destitute pro-Aristide neighbourhood of Cité Soleil in 2005 and 2006, and has subsequently contained or dispersed popular protests on issues ranging from political persecution and privatisation to wages and food prices. In the last few months the UN has also kept a lid on the growing pressure in the capital, Port-au-Prince, for improvement in the intolerable conditions still endured by about 1.3 million people left homeless after January’s earthquake. Today, cholera or no cholera, the UN’s priority is to ensure that next week’s elections go ahead as planned. For Haiti’s elite and their international allies, these elections offer an unprecedented opportunity to bury the Lavalas project once and for all. The political programme associated with Lavalas and Aristide remains overwhelming popular. After six years of repression and infighting, however, the political leadership of this popular movement is more divided and disorganised than ever. Fanmi Lavalas itself has simply been barred from participation in the election (with hardly a whisper of international protest), and from his involuntary exile in South Africa, Aristide has condemned the ballot as illegitimate. Many if not most of the party’s supporters are likely to back its vigorous call to boycott this latest masquerade, as they did in the spring of 2009, when turnout for senate elections was less than 10%. This time around, however, half a dozen politicians associated with Lavalas have chosen to run as candidates in their own name. They are likely to split the vote. Haiti’s people will be deprived of what has long been their most powerful political weapon – their ability to win genuine elections. Since it is almost guaranteed to have no significant political impact, this is one election that might well achieve its intended result: to reinforce the “security” (and inequity) of the status quo, along with the many profitable opportunities that a suitably secured post-disaster Haiti continues to offer international investors and its business elite. “This will be an election for nothing,” says veteran activist Patrick Elie. Properly managed, it may even provide an opportunity for rightwing presidential candidates likeCharles Baker to pursue the goal that has long been at the top of their agenda: restoration, with the usual “international supervision”, of Haiti’s own branch of the imperial army. And if that comes to pass, then when the UN eventually leaves Haiti its departure may only serve as a transition from one occupying force to another, reversing decades of popular sacrifice and political effort. In the meantime, though, it looks as if the UN may soon have more opportunities than ever before to fulfil its mission in Haiti.